Word on the street is the Super Bowl is this weekend. So before you get bogged down by heaps of consumerism and pass out in a nacho sombrero, Vox will lead you to the rest of the weekend’s most anticipated events. Bike over to the Kennedy Center’s Millennium Stage to catch three members of the National Symphony Orchestra perform works by Beethoven and Dohnányi. It starts at 6 p.m., and it’s free! 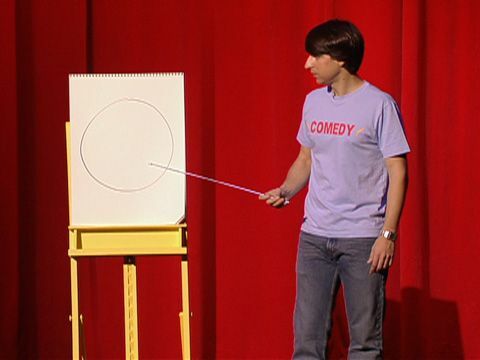 Demetri Martin, a stand-up comedian who blends the ridiculous with the, well, ridiculous, has a gig at the Warner Theatre on 13th St. The show starts at 8 p.m., and tickets are $35. The DC Arts Center takes the cake for sports events this weekend. The Art Decathlon pits artists against each other as they test their creative abilities in 10 disciplines of art. The opening reception starts at 7 p.m. The BI(G) LIFE: Two Solo Performances, written and performed by Jeremy Guyton (COL ‘12)and Allie Villarreal (COL ‘12), explores bisexuality and body image insecurity in contemporary society. The performance is in the Devine Studio Theatre (Davis Performing Arts Center) at 8 p.m.
Art fans will not want to miss the new Jackson Pollock Centennial Tribute at the Smithsonian’s Archives of American Art. And if you’re going to say “I could do that” to every one of his works, just stay home. But honestly, his paintings look like they were made by an infant with a paintball gun. The Kennedy Center’s Millennium Stage is hosting James Madison University’s School of Arts for a Debussy performance. It’s at 6 p.m., and like every Millennium Stage concert, it’s free. Georgetown Program Board is screening 50/50 in the ICC auditorium at 10 p.m. This surprisingly poignant comedy about two friends dealing with a cancer diagnosis delicately balances Seth Rogen’s raunchy humor with Joseph Gordon-Levitt’s heart-wrenching performance. Click here if you watch the Super Bowl just for the ads. You can thank me later for the time I just saved you. Bone Thugs-N-Harmony is taking the stage at the 9:30 Club at 10:30 p.m.
Watch the U.S. Navy Band chronicle the history of African Americans in the Navy to the accompaniment of music from John Coltrane to Grant Still. It’s at the Kennedy Center Millennium Stage at 6 p.m.
Head over to the Devine Studio Theatre at 2 p.m. for another performance of The BI(G) LIFE: Two Solo Performances.